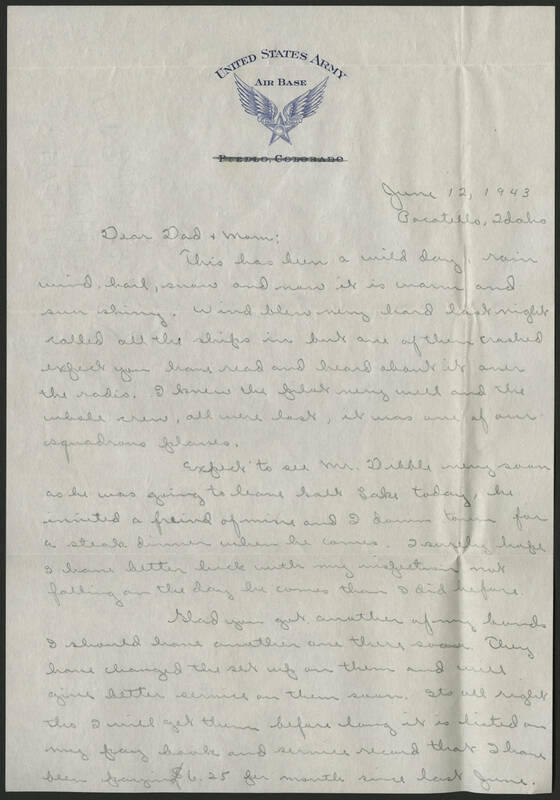 June 12, 1943 Pocatello, Idaho Dear Dad + Mom: This has been a wild day, rain, wind, hail, snow and now it is warm and sun shinning. Wind blew very hard last night called all the ships in but one of them crashed expect you have read and heard about it over the radio. I knew the pilot very well and the whole crew, all were lost, it was one of our squadrons planes. Expect to see Mr. Dibble very soon as he was going to leave Salt Lake today, he invited a friend of mine down town for a steak dinner when he comes. I surely hope I have better luck with my inspection not falling on the day he comes than it did before. Glad you got another of my [illegible] I should have another one soon. They have changed the set up on them and will give better service on them soon. Its all right tho I will get them before long it is listed on my pay book and service record that I have been paying $6.25 per month since last June.